If there’s one thing NLEs get wrong, it’s syncing. 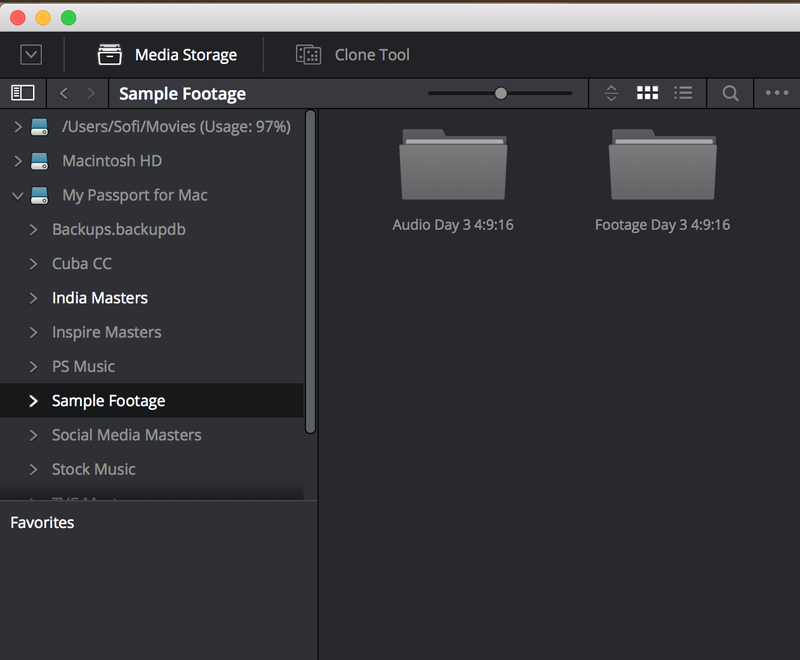 Avid, Premiere Pro, FCP X – none of them allows for batch syncing without caveats. On longer projects, syncing individual clips quickly becomes both tedious and a big waste of time and money. DaVinci Resolve has come packaged with expert batch-syncing capabilities for years – you can sync an entire day’s worth of footage with a single click. And while many editors have taken advantage of the software, many more still think of it as a complicated, high-end color correction tool. In this article, you’ll learn how to seamlessly integrate Resolve into your post-production workflow, allowing you to quickly and easily sync video to audio recorded on a separate device. We’ll cover batch auto-syncing by both waveform and timecode, how to make adjustments to your synced clips, and manual syncing. Why Sync in DaVinci Resolve? First and foremost, it’s free! And extremely powerful. I’ve found Resolve to not just rival, but surpass, paid programs like PluralEyes in both speed and flexibility. No other program gives you three methods of syncing while also allowing for easily baked in LUTs and color correction, trimming, and transcoding, all in one. Resolve is both easy to learn and is the fastest way to churn out synced dailies on a deadline. It allows me to import edit-ready files into my NLE and get right to work – no labeling or manually matching audio and video files required. As a feature film editor, I teach this method to my assistants and have used it flawlessly on countless projects. Even if you’re not familiar with the software, you’ll likely feel comfortable pretty quickly, as Resolve moves closer and closer to resembling a full-fledged NLE with every new release. Just this month, Blackmagic unveiled a major update to the software that includes tons of new features, improvements, and a drastically lower price point for the paid version. 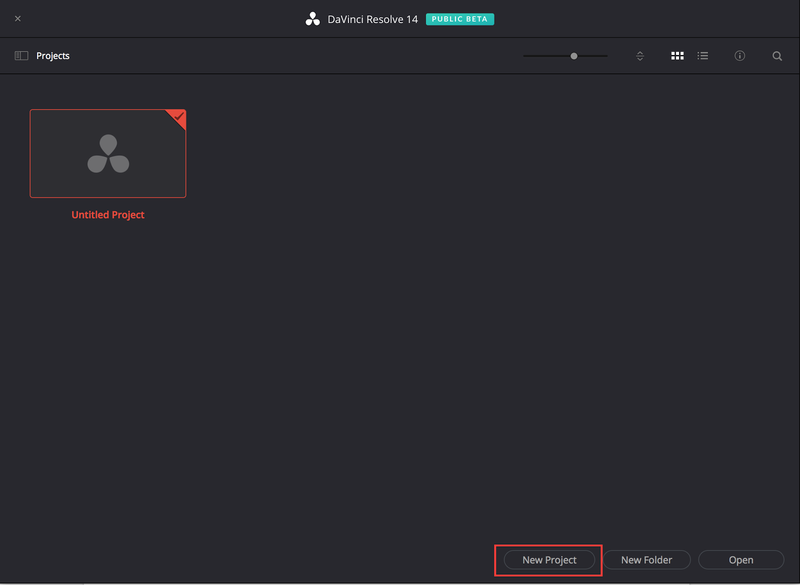 Download the latest version of DaVinici Resolve right here. Two options will be available for download: DaVinci Resolve and DaVinci Resolve Studio. We’ll be working with the first one – the free version – which is powerful enough for almost all syncing situations. DaVinci Resolve 14 (in public beta) is currently the most recent version and is referenced in this article. Launch Resolve and choose New Project from the project window. Name your project when prompted and hit Create. Double click your new project to launch it. The Resolve interface is organized into five different tabs, which you can switch between in the menu bar at the bottom of the screen: Media, Edit, Color, Fairlight (new with the release of DaVinci Resolve 14), and Deliver. If it’s not already selected by default, click the Media tab to begin importing media. In the top left corner, you’ll see the Media Storage Browser, which lists all the available hard drives you have connected to your computer, and allows you to browse to locate your footage. Below that, you’ll see the Bin List area, with a default Master bin. To keep my media organized, I like to add new bins for each shoot day of the project I’m working on before importing, labeled simply as Day 1, Day 2, etc. A new bin will be added under the Master category. I’ll name mine Day 1, since I’ll be syncing footage from the first day of a short film shoot. You can choose to organize your footage however you want, but I strongly suggest syncing in small batches, no more than a single shoot day at a time. Resolve can handle larger bins, but spot checking and fixing issues become more a hassle when dealing with a large amount of clips at once. Back in the Media Storage Browser, navigate to the video footage you’d like to import. Use the keyboard shortcut ⌘a (or ctrl+a) to select all video clips in a folder, or click and drag to select specific clips. Once selected, drag the clips on top of your bin to import them. If you haven’t adjusted the default project settings, then you’ll likely see a frame rate mismatch warning, asking if you’d like to adjust your project’s timeline settings to match the incoming media’s frame rate. In almost all cases, you’ll want to do this by clicking Change. The imported media will now be available in the Media Pool, which contains all of the media that you bring into the project. Since we’re syncing clips, we’ll need to import our audio files as well. Import both audio and video footage into the same, single bin. Import audio into its own bin inside of the video bin. Right click on your video bin and choose Add Bin from the context menu to create a new bin inside of it. Both options work the same, but I generally prefer to import both audio and video into the same bin. I find it reduces the amount of mouse clicks needed if I need to adjust clips or sync manually. Once you’ve made your choice, navigate to your audio files back in the Media Storage Browser, and import your audio the same way we imported the video, by dragging the clips to the appropriate bin. Now that we’ve got both our audio and video imported, let’s note some useful information that’ll help us verify our sync later. Select the bin containing your video clips and click on any clip. You’ll notice that the inspector to the right of the Media Pool populates with information about the clip. Locate the Audio Channels heading and note the number of embedded audio channels your video clip has. The clip I’ve selected has two channels. Remember that if you’re working with jam sync timecode, it’s possible your clip may not have any audio channels if no scratch track was recorded on set. Now, select any one of your sync audio clips. 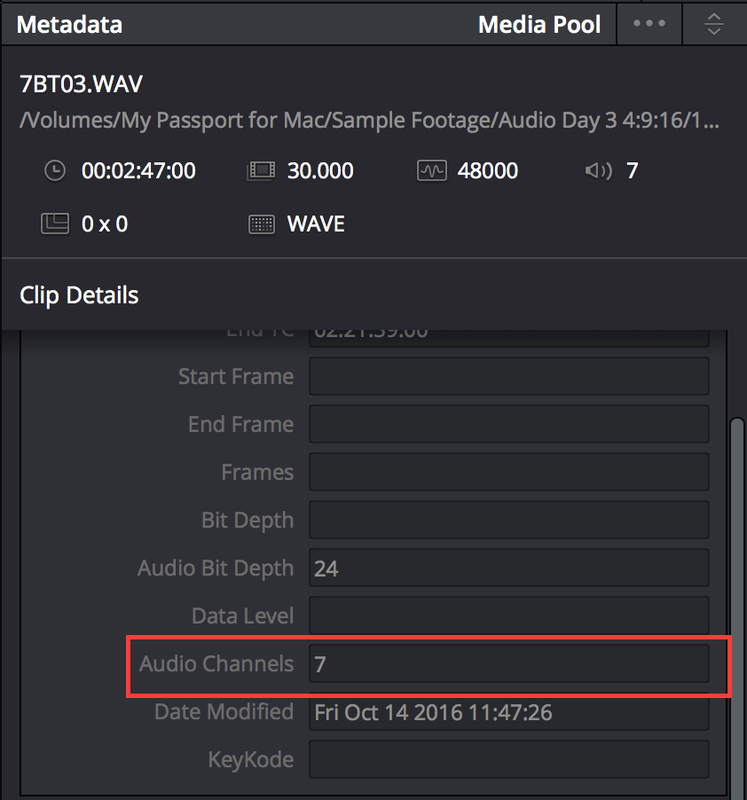 Again, the inspector will populate with the clip’s metadata, and we can see that the audio clip I selected has 7 channels. I suggest clicking through a few different audio clips since, depending on a scene’s mic set up, they won’t always all have the same amount of audio channels. You can also see information about all of your audio clips at a glance by switching to list view in the Media Pool. Click the list view button and then look for the Audio Channels metadata column. To switch back to icon view, click the icon button to the left of the list view button. We now know that our camera media has 2 embedded audio tracks, while our sync sound files have 7. We can expect that once we sync our audio and video together, we’ll have somewhere between 7 and 9 audio tracks in the synced clip, depending on whether or not we choose to keep the embedded camera audio available as a scratch track. Now that we know what to expect, let’s start syncing. Auto-syncing is as easy as choosing the right option and letting the software get to work. Select the outermost bin that contains both your audio and video media and right click it. Auto-Sync Audio Based on Waveform. Choose this option if you captured an embedded scratch audio track with your video. 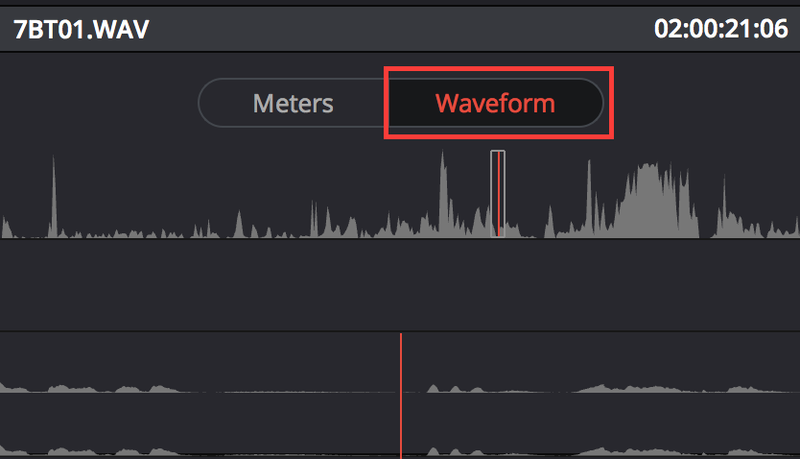 Resolve will compare the waveforms of your embedded camera audio to those of your sync audio files and match them up. In the synced clip, the camera audio will be replaced by the sync audio. Auto-Sync Audio Based on Waveform and Append Tracks. The same as above, except that the synced clip will include both the camera audio and the sync audio. Auto-Sync Audio Based on Timecode. Choose this option if your camera media and sync sound have matching timecode. Resolve will compare the timecode of your embedded camera audio to the timecode of your sync audio files and match them up. In the synced clip, the camera audio will be replaced by the sync audio. Auto-Sync Audio Based on Timecode and Append Tracks. The same as above, except that the synced clip will include both the camera audio and the sync audio. What if you have both matching timecode AND embedded camera media? When given both options, I tend to sync based on waveform. Throughout the course of the shoot day, jam sync timecode tends to drift slightly, causing some synced clips to be a few frames off. This isn’t always the case, but it happens often enough that I’ve found waveform syncing to be more reliable. The downside is that it does take longer for Resolve to compare waveforms than to compare timecode. Once you’ve identified the correct auto-sync option for your project, go ahead and click it and let Resolve get to work! A dialogue box will pop up tracking the progress. When Resolve finishes syncing, you may see a notice that some clips couldn’t be synced. Note the clips that didn’t sync so that you can troubleshoot later, if necessary. I usually just take a screenshot of the dialogue box (⌘+shift+3 on a mac), though often these clips are simply room tone or shots that were not meant to have sync sound. Before we address any clips that didn’t sync, let’s verify that the rest synced properly. I do this in two ways. In the media pool, your video clips will now have your sync audio embedded. Click on a clip in the media pool and just as we did earlier, look at the Audio Channels metadata to verify that it matches the number you expected to see. In my example, the original embedded camera audio had 2 channels, while the sync audio had 7 channels. I chose to sync without appending the camera audio, so I expect that the synced clip will have 7 audio channels, which it does. I also like to spot check a few clips to make sure that everything looks correct. Click on a synced clip to load it into the Viewer. In the Viewer, scrub through the clip until you get to the slate, then hit play and make sure the sync is correct. Repeat on a couple of clips. If you do end up with a few clips that Resolve couldn’t sync, try selecting just the two corresponding audio and video clips and syncing them individually. Sometimes waveform syncing works better when it’s only comparing the two tracks that should match. How you determine which audio and video clips match will depend on how your footage was shot, organized, and labeled, but once you’ve identified a matching pair, select the two clips in the bin, right click on either and choose your preferred sync option again. In most cases, this will resolve the issue, but if Resolve still isn’t able to sync the clip, then we can always sync it manually ourselves. Sometimes a low audio signal or loud noise can cause Resolve to pair an audio and a video clip that don’t actually match. Other times, the same issues can cause Resolve to not pair certain clips at all. Replace incorrect audio pairings by manually syncing the video to the correct audio file. Sync clips that Resolve failed to sync, as well as clips that don’t have jam sync timecode or embedded audio. Click the video clip you’d like to sync to load it up into the Viewer. Navigate the Viewer playhead to your visual sync point (slate, hand clap, etc). In the audio panel next to the viewer, select the Waveform tab. Now, select the correct audio clip in the Media Pool. Its waveform will open up into the audio panel, while the corresponding video clip will remain open to the right. Essentially, you’ll have two files open at once, side by side. The video clip on the left and its matching, but not yet synced, audio clip on the right. If the audio clip opens in the viewer and replaces the video, then go back a step and make sure you’ve selected the Waveform tab in the audio panel. In the audio panel, move the playhead to the audio sync point that corresponds to the video sync point. The top half of the panel shows a zoomed out waveform for the entire clip, while the bottom half shows a zoomed in section of the waveform that immediately surrounds the playhead. You can use your keyboard’s arrow keys to move frame by frame, as well as the standard transport controls JKL to fast forward and rewind. Once you’ve set the playhead to the audio sync point, click the Link/Unlink Audio button at the bottom right of the audio panel (the button will turn from grey to white) to embed the audio into the video clip. 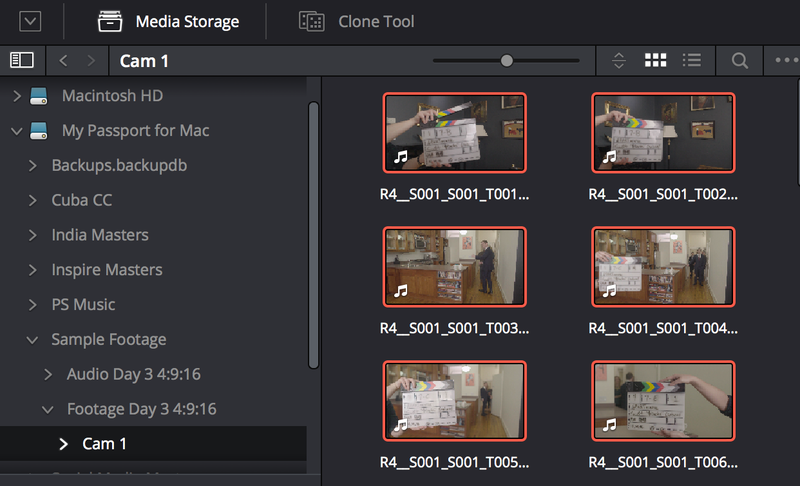 The audio and video items are now linked, and will behave like any other synced clip in Resolve. 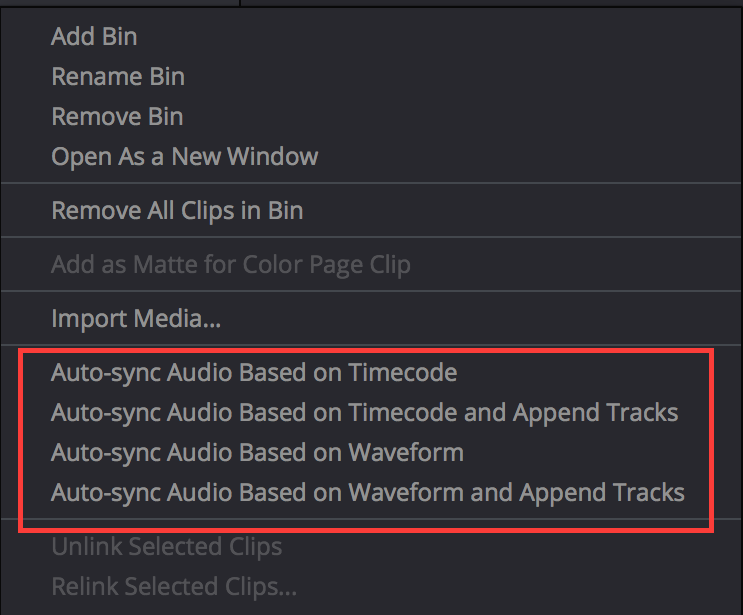 If you’ve used the Auto-Sync Audio Based on Timecode option and have noticed a sync drift of a few frames in some of your clips, you can easily fix the issue by slipping the audio. Select the clip or clips you want to adjust and choose one of the following options. Use the keyboard short cuts option+period (forward) or option+comma (reverse) or navigate to Trim > Slip Audio > Slip Audio One Frame Forward/Reverse: Slips the sync of any clip by whole frame increments. Use the keyboard short cuts option+right arrow (forward) and option+left arrow (reverse) or navigate to Trim > Slip Audio > Slip Audio One Subframe Forward/Reverse: Slips the sync of any clip by 1/10th frame increments. For more severe sync drifts, you can also adjust the audio and video sync points the same way you would manually sync clips, as described above. Just make sure to click the Link/Unlink Audio button to unlock the audio file before attempting to adjust its sync point (when unlocked, the button is grey and a play button appears below the audio waveform). That’s it! Once you’re satisfied that your dailies are properly synced, you can add them to a timeline in Resolve, apply LUTs, color correct, add watermarks, trim clips, etc., before exporting to whatever codec you choose. Don’t let Resolve’s Delivery tab intimidate you. While fully exploring its features is beyond our scope here, you’ll notice that it contains the same familiar export options as most NLEs and compression software. Just remember these three important settings when exporting synced clips. 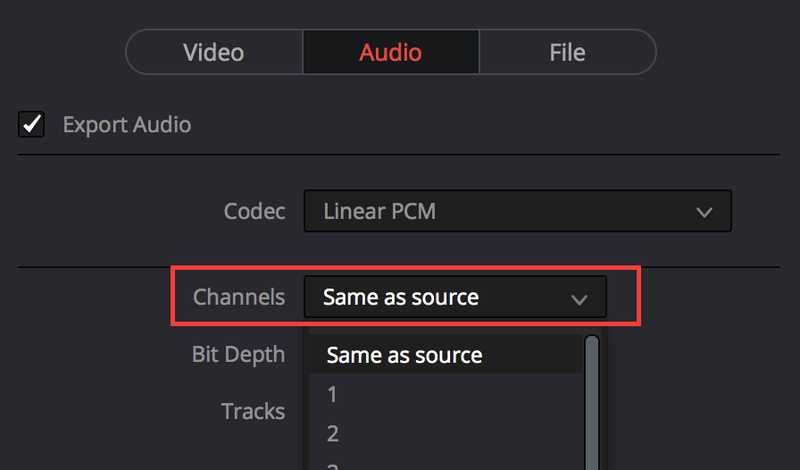 Under the Audio tab, you’ll almost always want to select the Same as source option under the Channels dropdown to make sure that all of your sync sound channels export. Also be sure that when adding your synced clips to a timeline for delivery, the timeline has enough audio tracks to accommodate the sync sound. Under the File tab, always select the Source name option for Filename uses. That way your clips will export with the same names as the original video files, allowing you to relink to higher resolution clips later on. I love this workflow and use it nearly exclusively on projects with sync sound. It allows me to bypass Premiere’s still-buggy merged clips feature and avoid both Avid and FCP X’s inability to batch sync by waveform (Avid can batch sync by timecode, but correcting sync-drift becomes tedious). For optimal success, I’ve found it helps enormously to talk with both the production and post-production team long before production begins, letting them know the details of your workflow. You can’t sync by waveform if the production crew didn’t know to record a scratch audio track! Talk to the project’s DP and sound recordist, explaining your post workflow. That way, you can decide between jam sync timecode or embedded camera audio and make sure everyone is on the same page before the chaos of production. Verify with the sound recordist that the scene and take numbers will be embedded in the audio file names or metadata. This information makes fixing any sync issues much easier because you can locate audio files at a glance. If possible, discuss your preferred workflow with the project’s post sound editor. 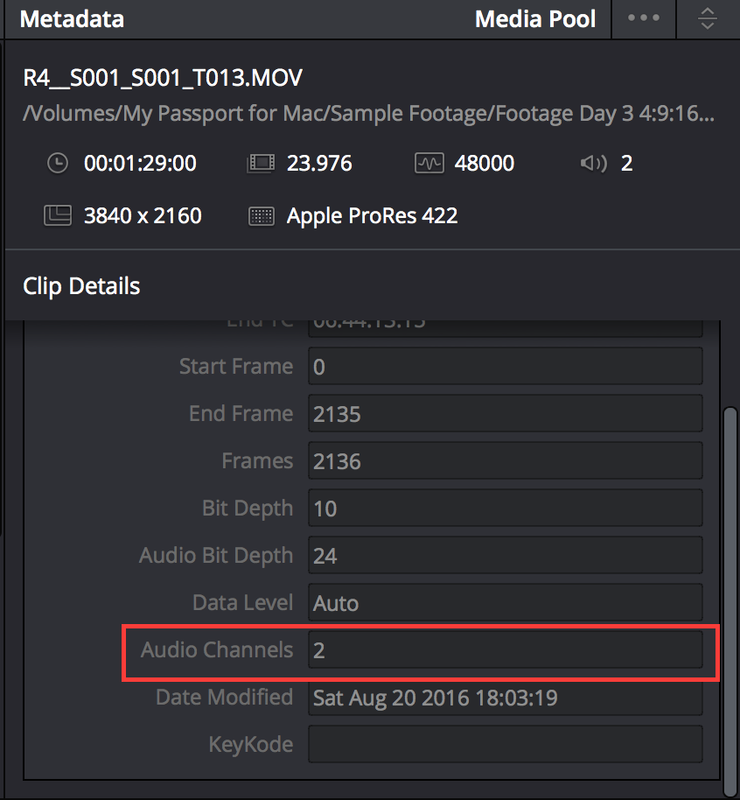 Syncing in Resolve removes certain metadata from the audio files that some sound mixers prefer to have. I’ve generally not found this to be a big issue, but sound editor Jeff Hinton makes a case against this method in his article. If you have any tips for your Resolve workflow, please comment below! Thank you to Sofi Marshall for contributing this article. 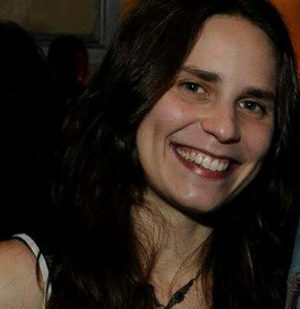 Sofi is an editor and screenwriter who’s award-winning work has screened across the US and much of the globe. She’s cut over a dozen features including Tracktown (dir. Jeremy Teicher), in theaters this spring, 6 Years (dir. Hannah Fidell), distributed by Netflix, and the Sundance sleeper hit A Teacher (dir. Hannah Fidell). She’s cut spots for companies like Western Union, Anheuser-Busch, Stack Overflow, and The Criterion Collection and also regularly edits media campaigns focusing on global human rights issues, helping to bring awareness to under-represented communities.